I’ve just tested a theory I heard of a long time ago and always wondered about. The theory is: When handsewing, does thread threaded from a spool twist more than if it were threaded from a bobbin? In other words, does it matter which end is knotted? Have you ever tried this to see? I suspected it doesn’t make much difference, but decided to do a twisting thread test. I cut two 70cm lengths of thread, one with a knot at the spool end and the other with a knot at the cut end. I ran the lengths through my hands several times to get the kinks out (recommended before handsewing). I sewed a length of running stitch with each, using the same needle each time. 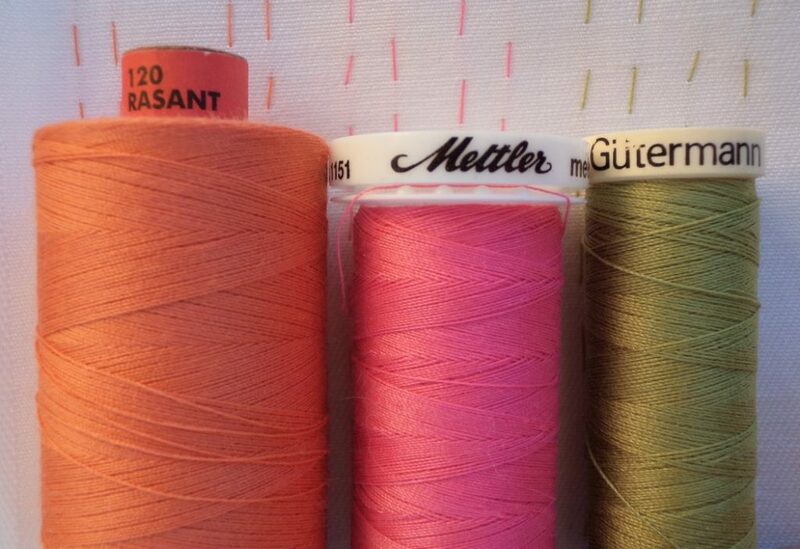 I did the same test with Rasant thread (orange), Mettler (pink) and Gutermann (green). I bet you’re all just dying to know the outcome! The results of the twisting thread test were: All the threads twisted. The Mettler threads (pink) and Gutermann threads (green) both twisted when I was about half-way through sewing, no matter which end the knot was placed. The Rasant thread (orange) with the knot in the spool end twisted much later (after 50cm of sewing) than the length with the knot in the cut end (which twisted after 25cm of sewing). So I conclude if sewing with Rasant, put the knot in the spool end.